One year ago as of the time of writing, the price of bitcoin traded between $930 and $978 – movements that perhaps set the stage for the cryptocurrency’s value to cross the $1,000 on New Year’s Day. Indeed, that headline-making development would be the first of many to come for 2017. In this article, we look at some of the major moments for bitcoin’s price during the last 12 months, a period of time that saw the price of bitcoin climb from below $1,000 to nearly $20,000 on the CoinDesk Bitcoin Price Index (BPI). It was a year that arguably exceeded last year’s bullish predictions and one that saw unprecedented interest coming from places – particularly in the finance industry – that some may not have imagined possible just 12 months ago. While January started off with bitcoin price fireworks, that month would also see one of the defining regulatory moments of 2017: an initial move by the People’s Bank of China, the country’s central bank, to tighten its oversight of the country’s then-dominant bitcoin exchanges. Yet, the warnings from Chinese officials didn’t cause the market death blow that some observers feared. However, it did lead to a drop in trading volume as a result of the imposition of new trading fees by what were then the “Big Three” exchanges – Huobi, OKCoin and BTCC. Those exchanges later halted withdrawals following new edicts from the PBoC, ultimately closing fiat trading this fall following further restrictions from Chinese regulators. Investors Cameron and Tyler Winklevoss first filed to launch a bitcoin exchange-traded fund back in 2013, setting the stage for a multi-year journey that led to the March 2017 rejection by the U.S. Securities and Exchange Commission (SEC). And while the SEC has since moved to review that decision – a process that is still pending – markets at the time reacted poorly, perhaps because some were betting that the U.S. regulator would approve rather than shoot down the proposed ETF. On the news, the market dropped by nearly 30% that day, ultimately recovering above the $1,000 level after the initial drop. But in what was perhaps a harbinger of the months to come, bitcoin’s price was back above its pre-ETF point within days of the ruling. And despite the reluctance expressed by the SEC at the time, a number of firms have filed to create bitcoin ETFs, with a particular focus on funds tied to cryptocurrency futures. If there was one phrase to define the period between May and September of this year, it was this: a new all-time high for bitcoin. The cryptocurrency’s price pushed past each successive milestone with apparent ease, including one on May 1 that saw bitcoin break past a record set on an infamous and now-defunct exchange. 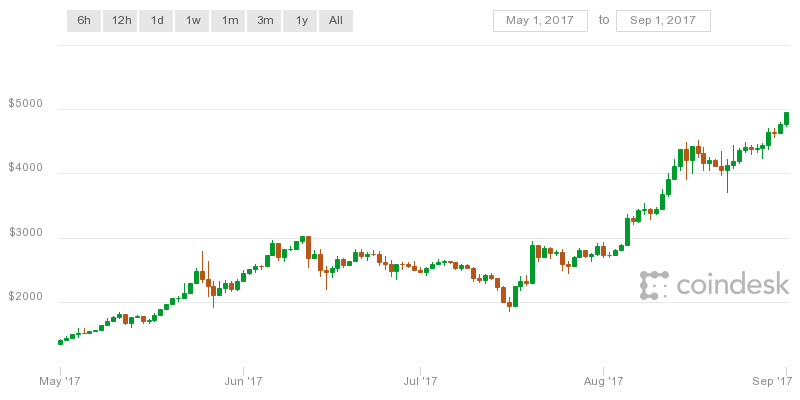 As May drew to a close, the price of bitcoin climbed above $2,000 for the first time and surpassed $3,000 just weeks later. At the same time, those price milestones were often accompanied by subsequent turbulence, including a drop of $300 within one hour just a day after the $3,000 line was first crossed. Perhaps one of the most noteworthy developments was the entry of major Wall Street analysts to the bitcoin price-watching game. Goldman Sach’s Sheba Jafari notably predicted the move past $4,000, leading to further forecasts from both Goldman Sachs and other analysts as the weeks and months progressed. By the first week of September, the price of bitcoin exceeded $5,000 for the first time – only to drop by hundreds of dollars two days later. Indeed, the coming days would see a reversal of the late summer’s gains, with the cryptocurrency’s price falling below $3,400 on Sep. 14 and down past $3,000 the following day. By mid-October, the September malaise had been forgotten and the price of bitcoin was once again above $5,000. 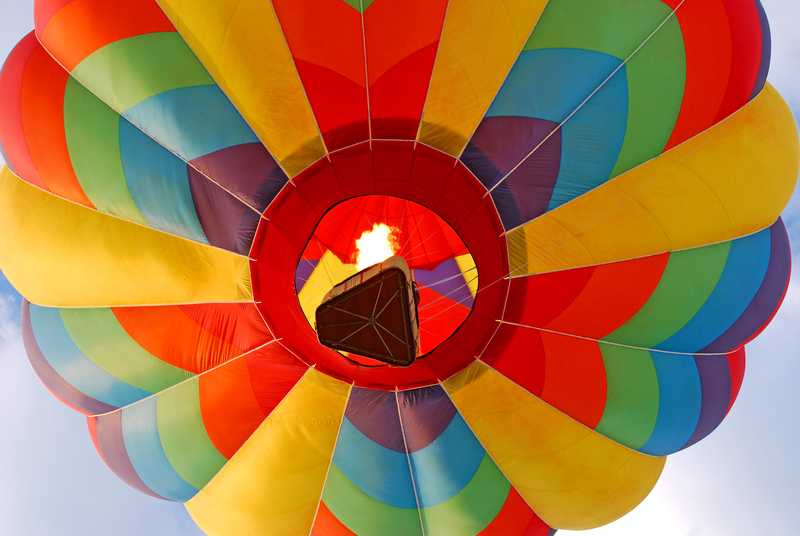 Despite the pending closure of China’s “Big Three” exchanges and a global crackdown on unregulated ICOs beginning to take shape, the price of bitcoin was largely buoyed by a bullish sentiment which would set the stage for some of the eye-popping moves in store for November and December. 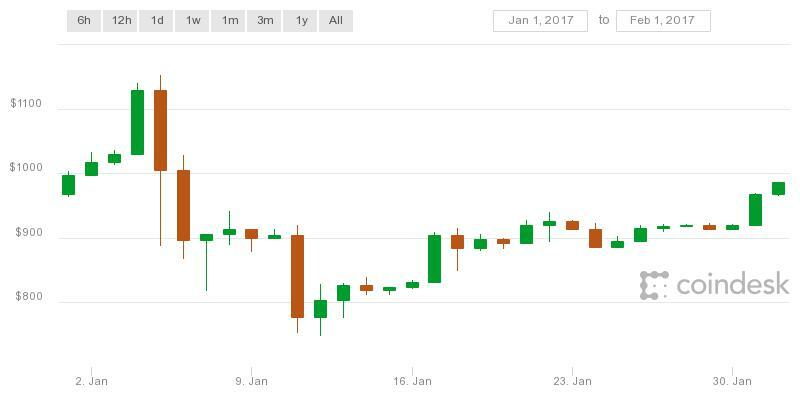 Yet for all the regulatory rumblings and forks away from the bitcoin network, the cryptocurrency’s price largely continued its upward trajectory, culminating with the CoinDesk Bitcoin Price Index’s all-time high of $19,783.21 on Dec. 17. But in a refrain of the moves seen after many of the all-time highs this year, that close encounter with $20,000 was followed just days later by a 30% drop that shaved billions of dollars off of the total cryptocurrency market capitalization. 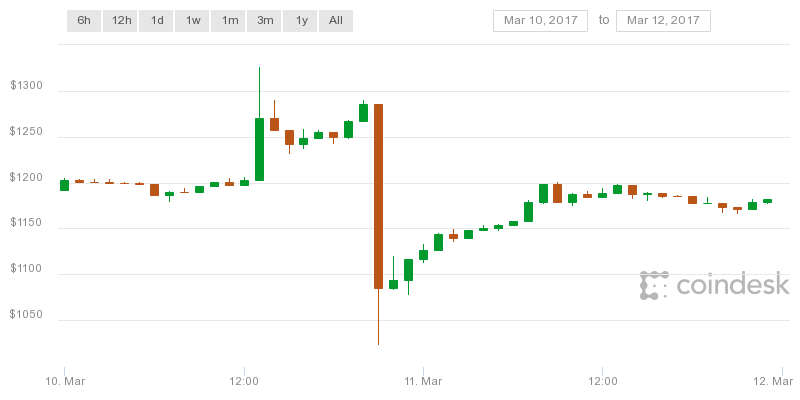 It was one of the biggest market corrections seen to date, sending bitcoin’s price tumbling below $11,000. Over the coming days, the price of bitcoin would recover, climbing back beyond $16,000 and higher on other cryptocurrency exchanges worldwide. 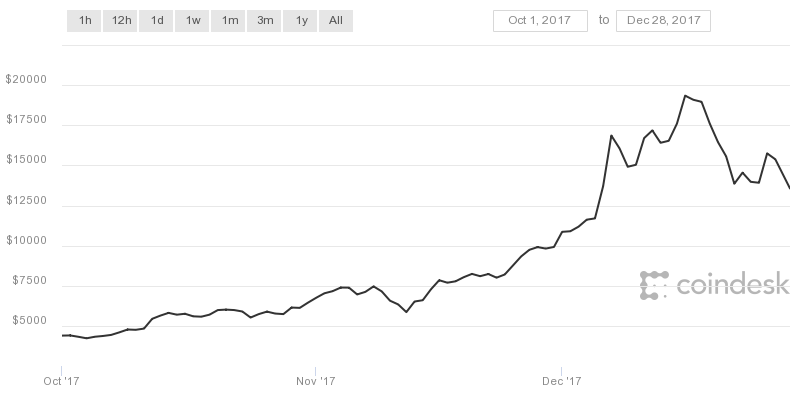 Yet as shown in the most recent graphs and price data, bitcoin’s value has begun falling, dropping to the mid-$13k’s on Dec. 28 after opening the day above $15,000. 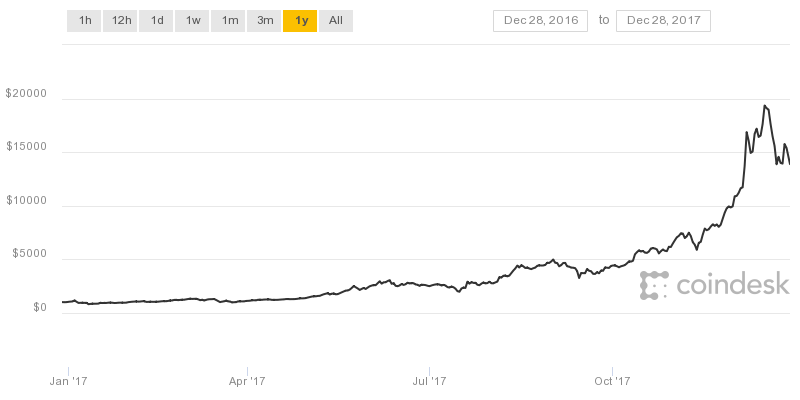 Indeed, the moves of the past few months raise the same old question: where does bitcoin’s price go from here? If 2017 is any indication, all bets are truly off.